Along from Toll Bar corner …. Next was the shop and private house of old York, the marine dealer. Old York had a small cart and donkey for his rag and bone collecting. He had two sons and one daughter. 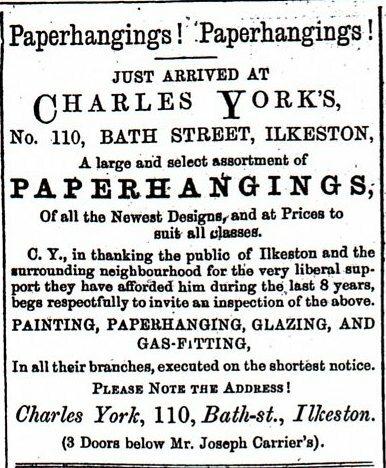 Joseph York left Hucknall Torkard — where he was a smallware dealer — in the 1850’s and arrived in Ilkeston with his wife Ann (nee Dove) and several of his children. Their older children — Henry, Mary, Ann, Hannah — would not be recalled by Adeline as they had left the family home before the move to Ilkeston. The eldest son married Harriet, eldest daughter of George Riley, New Street, now Station Road. He left Ilkeston when a young man. Sarah Riley had an illegitimate daughter Harriet two years before her marriage to Joseph York junior. As Sarah York she then had three further children with Joseph before he ‘disappeared’ in the later 1860’s. One further illegitimate child, John York, was then born in 1870. What happened to Joseph York? What happened to Sarah York after the birth of son John? The last ‘sighting’ I have of her at the moment is on the 1871 census at 5 Daykin’s Row, off Bath Street. Billy Boy has a possible solution to this puzzle. (see Comments). The following is based on his suggestions. After the disappearance of her husband, Sarah found a new ‘partner’ in Cotmanhay-born labourer John Henshaw and within a few years moved with him to the Park Street area of Lenton, Nottingham. They were accompanied by Sarah’s daughter Nelly (now a Henshaw) and there a son — Stephen Henshaw — was born in 1873. The 1901 Census finds the family in Calverton where John and now-married son Stephen are publicans. And by 1911 John is a widower, living in Radford, Nottingham. Sarah had died in 1905 — as Sarah York — aged 63. …. illegitimate daughter Harriet Riley, born in February 1858, married in June 1878 to coalminer Frederick Beardsley, son of Cotmanhay miner Frederick and Charlotte (nee Sisson) and for a time lived in one of the Riley Houses in Station Road. …. in September 1861, just before Sarah’s marriage to Joseph York, her daughter Lucy York was born. Twenty years later Lucy married Sneinton-born framework knitter Frank Cave, son of joiner William and Caroline (nee Etches), and ended her life in Burr Lane. The last of their seven children was registered as Caroline Etches Cave. …. her son Joseph York died in the winter of 1863, just a fortnight old. …. daughter Nelly York alias Henshaw was born about 1865 and may have married William Dickinson in 1893. …. son Stephen Henshaw was born in Lenton in 1873 and married Mary Ann White of London in 1896. At least one further question now arises ……. who was the Cotmanhay-born John Henshaw who whisked Sarah away to Nottingham? One possibility is that he was the husband of Julianna Sisson who married in April 1871 and who separated less than two months later. Between these two events their daughter Madeline was born. Born on Christmas Day 1851 Julianna Sisson was the daughter of Cotmanhay coalminer Thomas and Elizabeth (nee Stirland) and already had at least one illegitimate child — Gravelina Sisson born in 1868 — before her marriage. John Henshaw was (perhaps) the son of Leicestershire-born shoemaker later publican later farmer Stephen and Mary Ann (nee Aldred). P.S. On the 18881 Ilkeston census Stephen Henshaw senior is farming at the bottom of Stanton Road and living with him is a grandson John Henshaw, aged 10. Could this be Sarah York’s illegitimate son John York? Just a few weeks after the marriage of Julianna Sisson and John Henshaw the former was accusing the latter of assaulting her. One May evening she had gone to the Hand and Heart public house in Cotmanhay, carrying her baby Madeline with her. John was angered, hit his wife and sent her reeling, swearing that he would knock her bloody head off. ‘This unpleasantness was caused by some interference of his sister’. Julianna’s accusations led to a court case at Heanor Petty Sessions. When John appeared there to defend himself he was in a very bruised and battered state and argued that he was ‘not fit to bear the anxiety and excitement of the trial’. He claimed that Julianna’s mother Elizabeth and two of her older brothers, Albert and Ezekiel, had sought premature ‘justice’ and had beaten him severely… he had been put right off his food and was unable to go to work. John’s incapacity led to a week’s adjournment of the hearing when the concerned parties met again, this time at Ilkeston sessions. There the judge successfully urged reconsideration by the ‘injured defendants’. All charges and counter-charges were withdrawn ‘in order to avoid publicity in what was a family quarrel between a man and wife and her relations’ … so long as John would pay the legal costs of his wife. John agreed and the pair went their separate ways. Within a year of her separation Julianna had found a new, more ‘durable’ partner — Barzillai Jonathan Horridge, a Cotmanhay coalminer and son of John Horridge and his second wife Mary (nee Pollard). Their illegitimate daughter Mary Elizabeth Horridge Henshaw was born in August 1873 before — in October 1874 — Julianna decided to go through a bigamous marriage with Barzillai. The couple chose a suitably secluded spot about 140 miles away from Ilkeston — at St Anne Parish Church in Bishop Auckland, Co. Durham. On their return to Cotmanhay the couple represented themselves on every subsequent census as man and wife and their children as legitimate. However the latter were all registered as ‘Horridge Henshaws’, children of the ‘single’ Julianna Henshaw (nee Sisson) … they were Isabella, John Thomas I, John Thomas II, Keturah Louisa, John Thomas III, Martha Ann, Ada May, Bertha, John William, and Martha Alice. Julianna died in 1911 as a Horridge at 5 Horridge Street in Cotmanhay. Brazillai died in 1927 at the same house. Charles was a painter and decorator. I think he married Miss Whitchurch. 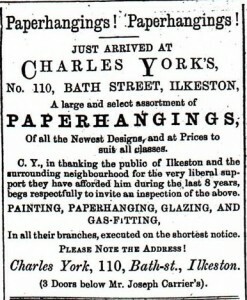 Charles York was in the same trade as his elder brother. In April 1872 he married Elizabeth Ann Whitchurch, eldest daughter of miller and baker John and Eliza (nee Hallam) and the sister of William Alfred who inherited the South Street furniture store of William Armstrong in 1870.In the early 1870’s the family moved from South Street into Bath Street, there to remain. Charles moved into 110 Bath Street, the premises previously occupied by watch and clock maker Joseph Carnill. This was opposite Number 8A Bath Street – home to the Sun Tea Company in 1878. Charles died at number 49 Bath Street in December 1906. Elizabeth Ann shortly thereafter moved to 21 Manners Road and died there in July 1942, aged 92. Born in 1851 Lucy was the youngest child. She was ‘at home’ at least until 1871. Gap alert!What happened to her after this date? Not mentioned by Adeline, Caroline Elizabeth York, older sister of Lucy, married in 1866 to furnace labourer Henry Ironmonger, the younger brother (possibly half-brother?) of bootmaker Nahum whom we met in Derby Road. We are now at Robey’s Yard.